A gunman opened fire Sunday morning at a Sikh temple outside of Milwaukee, killing six people and wounding at least three others, including a police officer, before being shot to death, authorities said. Updated at 10:36 p.m. ET: A gunman opened fire Sunday morning at a Sikh temple outside of Milwaukee, killing six people and wounding at least three others, including a police officer, before being shot to death, authorities said. A mass shooting at a Sikh temple in Oak Creek, Wisc., leaves seven dead, including the suspected gunman, and three wounded, including an ambushed police officer. NBC's John Yang reports. The identity of the shooter was not released and his motive was unknown. "We're treating this as a domestic terrorist-type incident," Oak Creek Police Chief John Edwards said at a late afternoon press conference. He did not elaborate. It was not immediately clear why local police were classifying the shooting as domestic terrorism. Federal law enforcement officials told NBC News the suspected gunman had no obvious connection to domestic terror or white supremacist groups and apparently was not on any list of suspected terrorists. The suspect was in his early 40s, and while he had an arrest record, it was for minor offenses, one federal official said. Greenfield Police Chief Bradley Wentlandt, acting as public information officer at the scene, said the shooting was reported at 10:25 a.m. at the Sikh Temple of Wisconsin in Oak Creek, south of Milwaukee along Lake Michigan. The shooting took place shortly before Sunday services were to begin. A police officer responding to multiple 911 calls came upon a gunman outside the temple and was shot multiple times, Wentlandt said. The gunman shot at another officer, who returned fire, striking and killing the suspect, Edwards said. The wounded officer was taken to a hospital where he underwent surgery and was expected to survive, officials told NBC News. Wentlandt said four bodies were found inside the temple and three, including the suspected gunman, were outside. He did not identify or describe the victims. Tactical police officers swept through the temple several times and found no signs of additional suspects despite earlier reports of a possible second gunman. Police officials says that they are treating the shooting by a gunman that left seven people dead, including the gunman, as a "domestic terrorist" incident. Reports of multiple shooters “were likely reports of the same shooter from different perspectives,” Wentlandt said. A law enforcement official told NBC News the gunman was dressed in a white T-shirt and black tactical-style pants, which had several pockets for holding ammunition magazines. He was armed with a single handgun, the official said. His name was not released but police say they have a tentative ID and were searching his home. FBI and police converged on a duplex in Cudahy, south of Milwaukee and about six miles from Oak Creek late Sunday. Witnesses told NBC station WTMJ that neighbors and residents were told to stay away as authorities were investigating the home. An ambulance, armored vehicle and bomb squad were on the scene. A police official later confirmed that law enforcement officials were executing a search warrant at the house. Officials told NBC News the suspect, who served in the U.S. Army, had many tattoos. The suspect had some kind of radical or white supremacist views but, as far as officials said they had heard, he was not in any kind of radical organization. His previous run-ins with law enforcement involved traffic offenses, they said. A Wisconsin police official says that at least seven people are dead, including the gunman, in a shooting at a Sikh temple outside Milwaukee. Watch the entire news conference. Edwards earlier praised the "heroic actions" of the responding officers. "They stopped this from being worse than it could have been." The temple's president, Satwant Kaleka, was among those shot, the Milwaukee Journal-Sentinel reported. Sukhwindar Nagr, of Racine, said he called his brother-in-law's phone and a priest at the temple answered, The Associated Press reported. Nagr said the priest told him that his brother-in-law had been shot, along with three priests. Nagr said the priest also said women and children hid in closets at the temple. A temple committee member, Ven Boba Ri, told the Journal-Sentinel that people inside the temple described the shooter as a white male in his 30s. "We have no idea," he said of the motive. "It's pretty much a hate crime. It's not an insider." Ri told the Journal-Sentinel the gunman walked up to a priest who was standing outside the temple and shot him. Then he went inside and started shooting. People inside the temple used cell phones to call people outside, saying please send help, Ri said. Three male victims, including the wounded police officer, were being treated at Froedtert Hospital in Milwaukee for gunshot wounds. All were in critical condition, hospital officials said. One suffered injuries to the abdomen and chest, one suffered injuries to the extremities and face, and one suffered injuries to the neck, Dr. Gary Seabrook, Froedtert's director of surgical services, said in a prepared statement. Oak Creek police, the Milwaukee County Sheriff's Department and other law enforcement agencies responded, the Journal-Sentinel reported. The FBI also assisted. Authorities closed roads and set up a staging area near the temple, WTMJ reported. Wisconsin state Rep. Josh Zepnick, who came to the scene, said he has been inside the temple many times. He described the shooting as senseless. "On a beautiful Sunday morning, the absolute last thing you would expect is a place of peace and love and spiritual worship would be torn to shreds by gun violence," Zepnick told WTMJ. "Our hearts go out to the victims and their families, as we all struggle to comprehend the evil that begets this terrible violence," Wisconsin Gov. Scott Walker said in a statement. "At the same time, we are filled with gratitude for our first responders, who show bravery and selflessness as they put aside their own safety to protect our neighbors and friends." Police from Brookfield, Wisc., west of Milwaukee, were sent to a Sikh temple there as a precaution after news of the Oak Creek shootings spread. President Barack Obama was notified of the shooting shortly before 1 p.m. by his Homeland Security adviser, John Brennan. In a statement, he said he and first lady Michelle Obama were "deeply saddened" by the shooting and that his administration would provide whatever support is necessary. 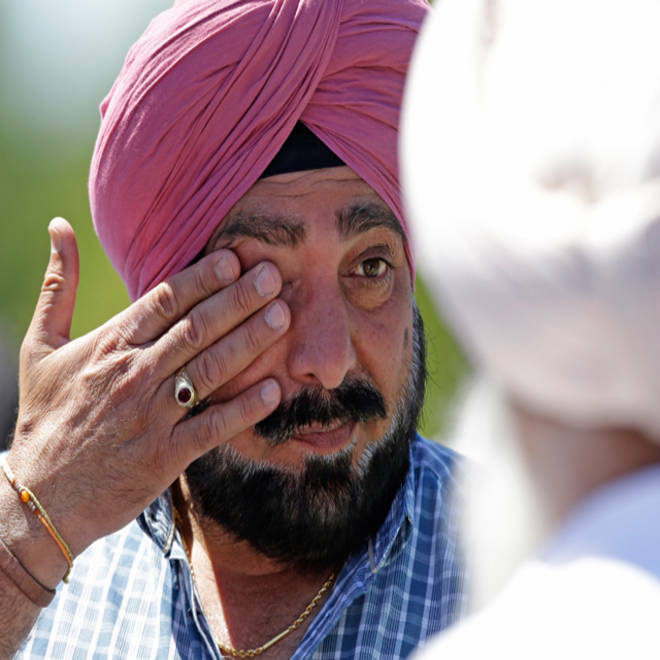 "As we mourn this loss which took place at a house of worship, we are reminded how much our country has been enriched by Sikhs, who are a part of our broader American family," Obama said. Republican presidential candidate Mitt Romney, in a prepared statement, said he and his wife, Ann, "extend our thoughts and prayers to the victims of today's shooting in Wisconsin. This was a senseless act of violence and a tragedy that should never befall any house of worship. ... We join Americans everywhere in mourning those who lost their lives and in prayer for healing in the difficult days ahead." The New York Police Department said it was increasing coverage in and around Sikh temples in New York City as a precaution. "There is no known threat against Sikh temples in New York City, however, the coverage is being put in place out of an abundance of caution," the department said. Sikhism is a monotheistic faith that was founded in South Asia more than 500 years ago. It has roughly 27 million followers worldwide. Observant Sikhs do not cut their hair; male followers often cover their heads with turbans -- which are considered sacred -- and refrain from shaving their beards. They are neither Muslim nor Hindu. The Sikh Temple of Wisconsin was founded in October 1997 with 20 to 25 families, according to its website. It currently has 350 to 400 people in its congregation and has grown rapidly, the group says. The congregation started in rental facilities in Milwaukee and formerly established itself in a building in 1999. It later bought 13 acres in Oak Creek and broke ground on the current temple in 2006. This article includes reporting by NBC station WTMJ of Milwaukee, NBC's Pete Williams and The Associated Press.